Okay, maybe a few things. First off, I want to hand it off to mothers who have fussy babies or babies that get up multiple times during the night. We have been extremely lucky in that department. Little man has been such a joy and has sleeping through the night since around 7 weeks. To this day he goes down between 8-8:30pm, as happy as a clam, and just talks himself to sleep in his crib, and doesn't make a peep till about 6:30 the next morning. In fact up until last night when he woke up crying around 10:30pm, I had to rack my brain trying to remember the last time he woke up in the middle of the night. Maybe 3-4 months ago? I didn't even know what to do. I felt like a new mother again. I called the husband and even he was at a loss for words. Rock him? Give him Tylenol? Well, it only lasted 15 minutes, and it was cured by holding him and a shot of Tylenol (teething). Thankfully he wasn't up again until 7 am. Again, I give props to moms out there, that aren't as lucky. Oh, yeah, this is a food blog. Sorry. Last night was dinner from Subway. I ran late getting home from the farmer's market and the husband was working the late shift, so it was all me baby. 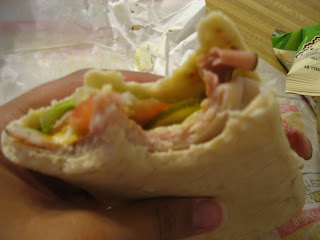 Pita wrap, turkey, ham, lettuce, tomato, pickles and mustard. Perfect. 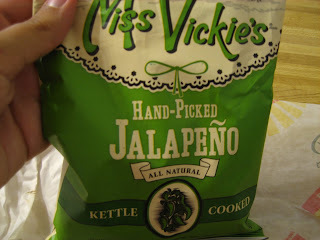 Oh, and Miss Vickie's jalapeno kettle chips. Love these! Also - I have a tomato! Only about a millimeter in size, but a tomato none the less. 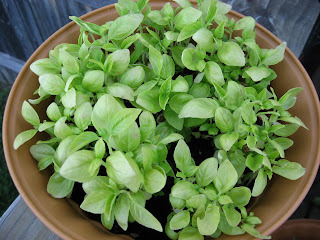 My basil is also doing really well, along with my cucumbers and zucchini - climbing up the trellis! On the agenda today is lots of time in the sunny sunshine - long walk, errands to post office and library (looking for Cooking for Mr. Latte), pulling more weeds (ugh), and making a huge grocery list, sorting coupons, and planning meals. Wow. If you read this whole post, thanks. I know it was pretty boring. Sometimes life just "is". my son never slept through the night until 10 months so i feel the pain of getting up at night...another thing that works well are hyland's teething tablets(there is another brand out there as well) they are homeopathic. hope you get some more sleep! I'm a firm believer that children should be born with a full set of teeth because teething is the pits! My youngest is working on her molars and she is one cranky baby! She just had a few pop through last week and she was good for a few days and yesterday I just noticed her gums were swollen again! Ugh!!! I love the cute, little tomato!! Can't wait to see all of your produce when it is grown!!! Poor baby!! :( I sure do have a lot in store for me!! I had no idea that subway offered pita wraps now! Awesome!! Oh and those chips look great. I'll have to remember that the next time I stop there. Have a great day with that sunshine Ally! You're doing great not having to get up at night! I hope I'm that lucky! Your garden looks fantastic! These are always my fav photos. I too was lucky to have a baby that slept! When she was around six weeks old, I fed her in the morning around seven a.m. She fell asleep so I put her back into her crib. At seven p.m. she was still sleeping! I kept checking on her to make sure she was still breathing! I called my Mom and asked her what I should do, and she said "wake her up." It never dawned on me to just pick her up! She woke up, I fed her again, only to have her fall asleep again until the morning! 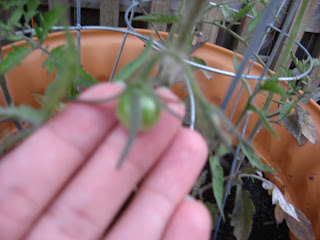 Yeah for the baby tomato!!!! That's exciting!! Ugh....those middle of the night awakenings are rough. My kids normally don't wake up in the middle of the night but I'm all out of sorts when they do! 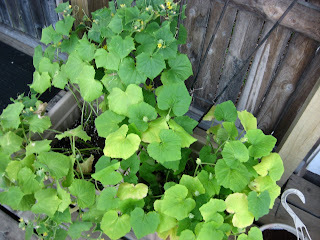 We are growing some great veggies in our garden, but no cucumber! What were we thinking?! I love cucumber. Maybe next year. That is wonderful that your baby cakes sleeps so well!And your veggies and basil are looking fabulous. Its very exciting when the garden progresses!! your tomato is so cute. I just hope that it will grow bigger next week. The basil is awesome. They are really healthy in the photo. Babies are really like that. Mothers should understand babies that they really want they mother always on their side. It is just like gardening you should focus on caring all of your baby plants.